The project consists in an epidemiological research on predisposition to Glaucoma among children together with the Department of Ophthalmologic Sciences, at "La Sapienza" University of Rome, Unit of Corneal Physio-pathology of the Policlinico Umberto I. The grant given by the Nando Peretti Foundation has been used to buy the basic instrumentation for the research. 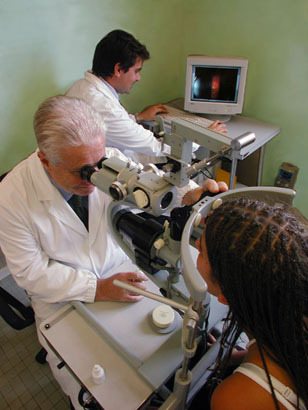 Glaucoma is a major cause of blindness in the world. Nowadays, when diagnosed in its very early stage and promptly treated, either medically or surgically, glaucoma is considered a life threatening disease only in very rare cases. But, if insufficiently treated, it can easily lead to blindness. Being a non-symptomatic disease, the risk to miss a precocious diagnosis is very high. The goal of the research is to investigate if ocular hydrodynamic disorders can be discovered among close relatives of glaucomatous people, particularly among children and young adults. This is an outstanding opportunity for making precocious diagnosis and better decisions in therapy. The second purpose of the research will be to verify if the positivity to the test can be considered a risk factor or even a prognostic finding for myopia developing. The test to be applied is simple, cheap, non-invasive, risk free and well accepted by patients. Young relatives of glaucomatous patients will be recruited. Each eligible subject will undergo an ophthalmologic screening with the aim to quantify their predisposition to glaucoma.